The Pirate ceilidh was great fun and there was a good turn out of well turned out Pirates!! Cadi Ha Morris of Bangor did some dancing in the interval spot. We also had a good time playing for a Burns Night at RAF Valley. Our next open event is a community ceilidh in Llanfair Talhaiarn, near Abergele. This is their first village ceilidh and it is open to ALL. Happy New Year to all! Our new year resolution will be to try to keep our News and Blog page up to date! Starting with exciting news of a Pirate Ceilidh open to all on Friday, 18th January at Powis Hall, Bangor Uni Main Arts Building, College Road, Bangor, Gwynedd. Do come if you are in the vicinity. Also!! We are very pleased and excited to be asked back to the Llanwyddyn Weekend of Folk and Acoustic Music to do the Friday Night Ceilidh. This is a fabulous and friendly festival with always a great line-up. It's tonight!! Don't miss this fantastic ceilidh in Criccieth. All welcome and tickets are available on the door. Well what a busy summer we have had, mainly playing at weddings and private parties. We had a great time at Llanwddyn Folk and Acoustic Weekend and have been asked to play there again next year. Some photos and video to follow. We had a great time at the Padarn Hotel in Llanberis last Saturday. It is a lovely friendly venue. If you missed it, don't worry as there is another open ceilidh on Friday, 3rd February, at Powis Hall, Main Arts Building, College Road, Bangor. All Welcome! This will be a great evening with Cadi Ha Morris performing in the interval. The ceilidh at Padarn Hotel is to raise money for Wales Air Ambulance and Riding for the Disabled Association. This will be a great evening. Do come!! We hope everyone had a fantastic Christmas and we wish you all a Happy New Year. We are looking forward to playing for more ceilidhs in 2017! There are a couple of community events coming up later this month and in February. So we will add more details of these in the next week or so. 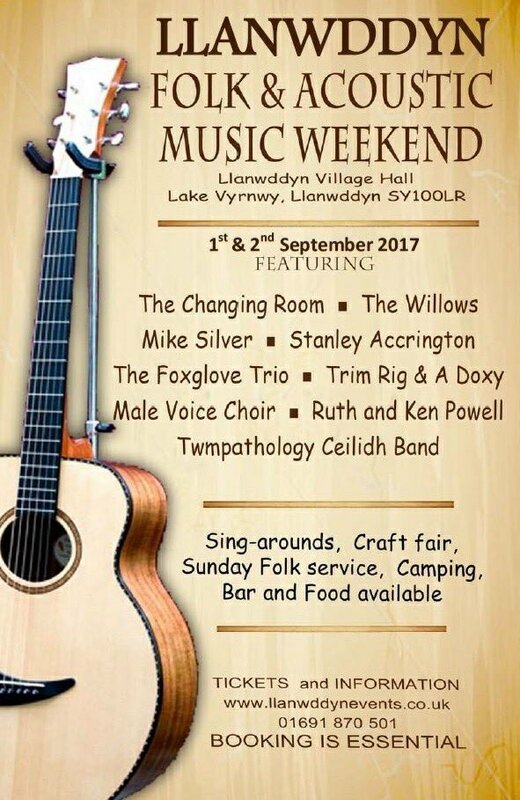 We had a great time playing for Llanwyddyn Folk and Acoustic Weekend near the beautiful Lake Vyrnwy in September last year, and ... good news! ... they have asked us back to play this year. Details below. This is a super friendly little festival and we will look forward to playing there again. Well we have had a busy summer so far and have played at some gorgeous venues, including fairytale chateau overlooking the Menai, tipis overlooking the sea, heavenly glamping sites, and the grand hall in Bangor University. September continues to be a busy month for us and we are very excited to be playing at the Llanwyddyn Folk and Acoustic Weekend this Friday for the Friday night ceilidh (see below for poster of the weekend). We have done some recording too, so hopefully we will be able to add some new tunes and songs to our web-site in the next few weeks. We are looking forward to playing at the Anglesey Arms, Caernarfon on Easter Saturday, 26th March as part of the Miwsig ar y Wal event. Come and say hello! ALSO ....We are now listed as performers on the Noson Allan/Nights Out Scheme. This scheme gives help with funding for Community Events. For more info about this, take a look at http://www.nightout.org.uk/home.aspx. We have been very busy playing for some lovely weddings and parties this Summer and been to some beautiful venues, including Bach Wen Farm Cottages, in Clynnog Fawr and the Gwenfrewi Project near Llanwrst. We have also been back to the lovely Hafod Farm and Llyn Gwynant Barns in Snowdonia. We are now looking forward to hosting our own ceilidh at Mynydd Llandegai Memorial Hall. This should be a great night so do come if you can make it. Hopefully this will be the first of many events in the North West Wales area so WATCH THIS SPACE!!!! The W.I. Ceilidh at Llangoed, was a great success and £730 was raised for the Wales Air Ambulance. Many thanks to all who came. We are having a great summer, mostly busy with playing for weddings at lovely locations in the North Wales area. However, we are really looking forward to playing at a Ceilidh organised by the W.I. with proceeds going to Wales Air Ambulance. It is on Friday 17th July and all are welcome! Hope to see you there! Feb 28th 2015 - We had a FANTASTIC time at HWYL festival, Green Man's St. David's Day celebration at Cecil Sharp House in London. We took our 'Wild Welsh Twmpath' to London and everyone had a good time dancing.